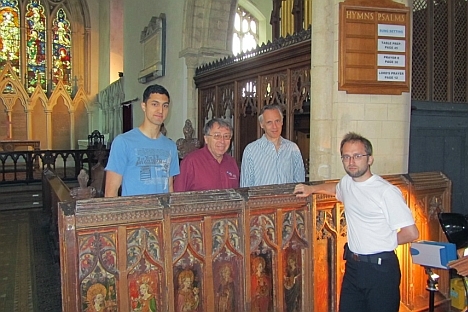 Professors Roman Maev (second left), and Spike Bucklow of Cambridge’s Hamilton Kerr Institute (second right) with two Canadian-based graduate students in physics from the University of Windsor, Mo El-Youssef and Dmitry Gavrilov, in the Church of St.
One man’s passion for physics and painting could bring an end to the world’s estimated $6 billion market for art forgeries. Earlier this year Spike Bucklow of Cambridge’s Hamilton Kerr Institute led a small team of graduate students to a church in Norfolk where ancient paintings had been hidden in the early 15th century. When Henry VIII formed the Anglican Church following the Pope’s refusal to grant him a divorce from Catherine of Aragon, the paintings had been hidden by the parishoners determined to save them. Crafted under wooden benches inside the church, they remained undiscovered for centuries until a group of religious scholars had recently discovered church scriptures documenting the clandestine operation. Bucklow could think of one man with the technology capable of painting an accurate description of the icons origins: Roman Maev. “He’s developed technologies that are novel in his field. Our question was whether there was value in looking at ancient paintings,” said Bucklow. Maev, a Canadian-based physicist with Russian roots, helped create diagnostic imaging that can be used to discover and authentic ancient art as well as expose forgeries. “We were able to visualize the most intricate details of the icons, which had been lost to civilization for centuries,” Maev said. He is currently focused on revolutionizing the world’s $40 billion art market, or, more precisely, the 15% of it that consists of forgeries. According to the FBI, $6 billion is spent annually for forget, misattributed or stolen art. But the passion for art never wavered, even as Maev’s work took him permanently to Windsor, Canada amid a crumbling domestic science infrastructure in the 1990s. “I had a realization at one point, long after moving to Canada, that the work I had done in graduate school as a physicist, namely, analyzing glass, wood and practically any kind of solid, could be applied to the world of art,” he explained. Maev then took his technology on the road, attending art conferences in places like Italy, England, Denmark, and Israel, and eventually found partners interested in determining if their collections were genuine. “We would sign confidentiality agreements with wealthy collectors. I would explain it to them simply: ‘I can’t tell you whether you own a real Rubens or not, but I can say with great accuracy whether the painting matches the time period, has any obvious signs of forgery and adheres to the author’s “signature” or chosen colors and materials present in all his work,’” explained Maev. After patenting his technique in the United States and 15 other countries, Maev’s goal is to establish a mobile lab he could take anywhere in the world. “London is the undisputed art capital of the world – the best museums and auctions are all there,” he said. “It’s dangerous to have too much faith in any one particular type of information,” Bucklow added. In Russia, there is already an interest in analyzing the country’s leading artworks through Maev’s technique. “But at the Ministry of Culture they told me – this has to be done at a state level,” he grinned. There is serious concern that violence could ensue if wealthy collectors began to discover the real scale of forgery they were subjected to; and the backlash could come against Maev from the forgers themselves.